WINTER GARDEN, Florida – It happens each time an active shooter strikes, and mass tragedy occurs. In the ensuing days, we talk about school security and witness demands to produce strategies to make sure it never happens again. But after the anger subsides, and the screaming and finger pointing stops, we’re left with the fact, as a society, we bear responsibility, yet we remain complacent. Why can’t we do something about school security. Mass casualty shootings have been happening for decades. When will we wake up? These tragedies will continue to occur until we wake up. Government officials, including school boards, superintendents, and law enforcement must develop long-term strategies to eliminate the problem. Officials must display leadership. If we truly want to stop the carnage, officials must seize the initiative, examine best practices and take up strategies that will produce results. We need to address school security. We must accept the hard facts where we are deficient when it comes to school security and protecting students. We must identify, train and educate personnel to be alert for all aspects of aggressive violent behavior that mental health experts and security officials think might suggest someone is thinking about committing an act of violence, including body language and demeanor. Thereafter, school security officials and mental health experts should develop “protocols” to mitigate any threat, identifying and establishing indicators/scenarios when to engage someone they “suspect” might commit an act of violence. Trained security consultants should be used to assist school officials with forming policy and establishing procedures to mitigate any threat and later hired to implement the “protocols.” Security and school officials should be trained to recognize “clues” that might suggest an active shooter scenario, e.g. someone wearing inappropriate “heavy” clothing on a warm day and conduct active shooter training exercises. Parents must be responsible for their children and monitor their activities on the Internet and Social Media. Kids should be admonished about using web sites that portray simulations of mass killings or violence or other obsessions suggesting violent behavior. Privacy rights are non-existent when it comes to minors using the Internet and Social Media. Also, minors need to be counseled about “bullying,” and its dreadful consequences. These are important considerations when we’re talking about school security. Legally obtained weapons need to be properly secured, especially in an environment that includes children. If it is found weapons were “not” properly secured, immediate consideration should be given to prosecuting the parents and/or guardians, as well as the shooter and inserted into the criminal justice system. Every school needs to have a secure perimeter. No one should have the ability to enter any school “unchallenged,” and be able to stroll down a hallway without checking in, providing identification or being approached and questioned. Consideration should be given to minimizing access points and entry procedures, including staggering entry and dismissal times. Schools need to have a magnetometer to detect the existence of a weapon. Protection is an ongoing process. Officials need to establish a multi-layer security level meant to harden a soft target and deter, detect and deny entry if needed. Important considerations when it come to school security. Ingress and egress points need to be secure, including exterior doors, windows and vehicle management. Positive entry control systems (aka: man traps) need to be considered that includes routine bag check and magnetometer screening, key management, emergency route exits and employee screenings. School Resource Officers [SRO] need to be trained and hired … number determined by an agreed upon formula using square footage or student population. SRO’s deployed need to be visible and roving across the campus throughout the day. CCTV needs to be established for use conducting visual surveillance for both interior and exterior areas, including the ability to monitor entrances, exits and hallways, as well as more congested areas like gym, cafeteria and/or library and/or restricted areas like a teacher’s room or dressing area. Officials also need to consider establishing a communication system, setting up a single contact point for reporting threats, and alarm management, as well as establish a system to alert law enforcement officials. Also, officials need to consider establishing a system to lock entrances and exits, large venues like a gym or cafeteria or library, stairs, classroom doors, hallways and windows. Likewise, consideration should be given establishing a barricade device in the classroom (check for code requirements) and providing “active shooter” information and training to “not” just officials but students and staff. Review and utilize ISO 31000. A generic risk management standard which can be applied to any type of risk. Be proactive. Review your security policy and procedure. Make every effort to seriously decrease the possibility entry can be made to any school with any type of weapon. Just several considerations talking about school security. In general terms, the writer recommends that officials consider publicizing any new/improved security procedures hardening a facility. The publicity might discourage someone from making an attack, per chance, he/she knows a target has been “hardened.” Also, the media must accept the fact that blanket coverage of an incident creates an incentive for additional tragedies. The writer suggests media officials only consider briefly reporting on an incident, and “not” naming and/or showing a photograph of the assailant. Any consideration to “arming” teachers, officials need to hold forum with the community and conduct discussion. Per chance, the school district decides to “arm” select teachers, the district then must mandate that “armed” teachers must attend firearm’s training both in a classroom setting and on the firearm range. Teachers must pass both aspects of the training with a minimum qualifying score totaling +/- 75-80 percent. Following initial certification, teachers must then re-qualify on the firearms range every quarter. Considering the liability, not to mention the cost to insure, train and maintain a teacher’s firearm skills, deciding to arm selected teachers is a difficult decision for a community to make. As a proactive security consultant, the writer recommends that school officials first consider “hardening” schools and using protocols to identify suspects of would be school violence before considering arming select educators. Arming school personnel to mitigate a mass casualty incident is fraught problems. Having carried a weapon for over 30 years, the writer knows there is a lot more to carrying a weapon than just being able to shoot, not to mention confront a suspect bent on killing as many people as he/she can. Since virtually nothing has been done to effectively address mass shootings in our schools, the writer says he has written this piece wanting to initiate a discussion about gun violence. Unless something is done, the writer believes mass casualty incidents will become even more common place. He thinks some may read the piece and think his comments are much too tough while others will say the cost to implement the changes much too exorbitant/excessive [which he thinks is also part of the problem]. 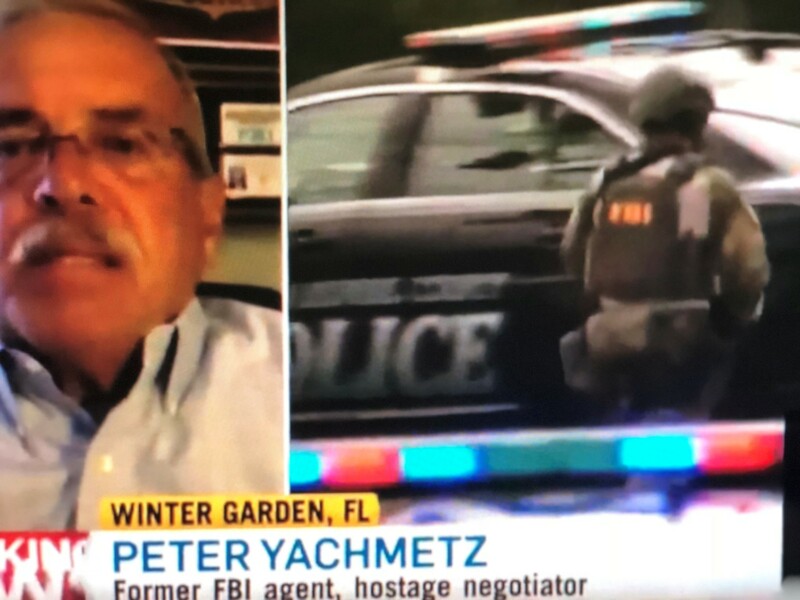 PETER D. YACHMETZ is a retired FBI agent, a 29-year veteran, with both private and corporate sector security experience. He is classified as a Subject Matter Expert (SME) in Physical Security & Access Control and is well acquainted with all aspects of Field Intelligence [FI], Terrorism [T], Crisis Management [CM], Physical Security [PS], Special Event Security [SES], Corporate Security [CS] and Corporate Security Programs [CSP]. He has directed corporate security operations and planning, conducted security assessments [identifying vulnerabilities] and has implemented proactive security protection measures [correcting vulnerabilities and deficiencies in both site security & access control]. A plain-clothes operative attached to the security complement of the WALT DISNEY COMPANY [WDC], Pete also has experience monitoring major security events. Applying established security measures, he regularly protected WDC’s reputation and brand … all while ensuring guests, cast members & company assets were kept safe and secure. Pete is also trained and experienced as BEHAVIORAL ASSESSMENT SPECIALIST. YACHMETZ CONSULTING GROUP LLC – Founder/CEO – Pete is a security & risk management consultant who provides physical security for facilities needing protection and does special event planning for clients sponsoring a major event. Likewise, he also can conduct Vulnerability Assessments [VA] and Due Diligence Screenings [DDS] in connection with any upcoming major event. His training and exper-tise in security, longtime law enforcement contacts and available resources, not to mention proactive approach, make him the go to person for individuals and companies seeking security and protection.